Today’s manicure is nearly identical to last year’s! I used the same base and a similar glitter topper. How funny! I guess I my nail art has not changed that much. I tried one-stroke flowers but my nails were too short and the petals looked like blobs. I reached for my striping brush and the rest is history. The finished design was not what I planned for but I love the outcome! It kind of reminds me of tiger stripes. I hope you like it! I thought the matte acrylic paint looked really cool against the shiny base so I matte the entire manicure. It did not look very good so I am glad I took pictures beforehand! I kind of wish I had taken pictures before topcoat as well! I used 2 coats of Color Club Wham! Pow! and a generous coat of Formula X for Sephora Bombshell as my base. I bought this in celebration of Halloween last year and turned out it was limited edition. It is no longer available as part of the Explosives line. Great formula and I did not need to fish for the pieces. It dried a little gritty but only needed one coat of Seche Vite to even it out. I used orange, white and black acrylic paint to detail. 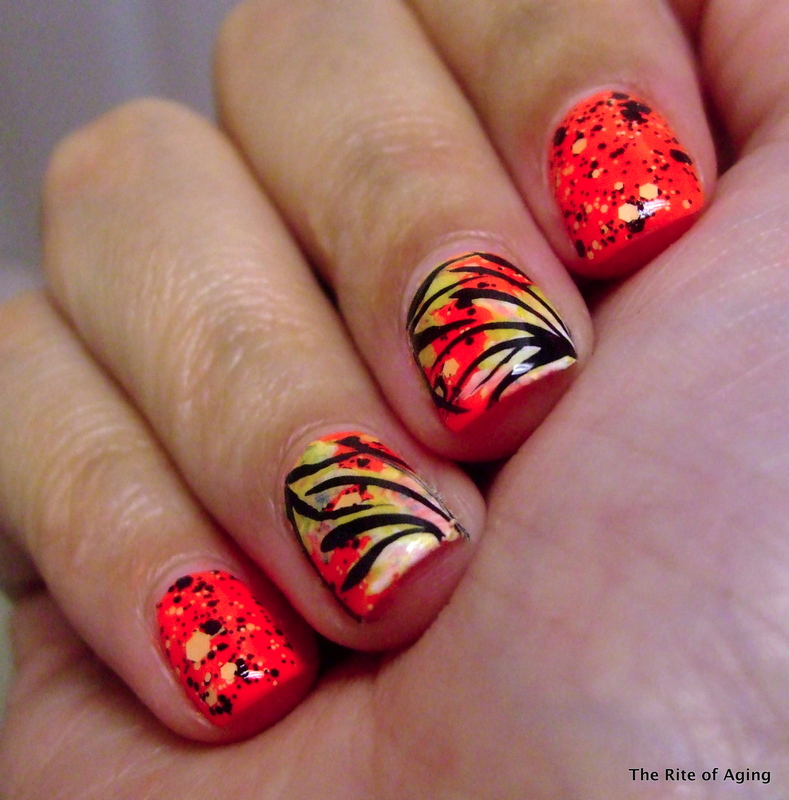 Check out the other orange manicures below!